Born and bred in Malaysia, Bernard Chu appeared on hit show MasterChef and co-founded his own Melbourne-based patisserie, LuxBite. From fruity flavours such as watermelon, raspberry and piña colada; to classics such as chocolate and pistachio; and even fusions such as black sesame, bamboo oolong tea and rose and lychee, the selection of macarons seems endless. Other than their stunning macarons, one of their most famous cakes - Lolly Bag Cake, steals the show every single time. The Lolly Bag cake has 7 layers. It starts with Banana lolly joconde (almond sponge cake) on the bottom, followed by Freckles crunch, mandarin Jaffa ganache, Musk mallow, a second layer of Banana lolly joconde, Spearmint leaf buttercream and finally on top, a Redskins glaze. Also, keep an eye out for them during Malaysian festivals like Merdeka, there will always be a special malaysian flavoured inspired cake to match the theme! It’s located on Toorak Road, and it’s the perfect place for afternoon tea with its cosy modern interior design. Catch a train to South Yarra station, and 7 minute walk to the shop! Melbourne’s dessert masterchef - Darren Purchese, has his own sweet studio where he crafts his masterpieces, ranging from delicate entremets, choux pastries, glazed cakes and even gourmet ice cream pops. A must try when you’re in Melbourne! Besides that, they are offering wonderful afternoon teas starting from 2016 - http://www.melbarestaurant.com.au/aria/whats-on/burch-purchese-afternoon-tea. The fusion of asian flavours such as lychee, pink guava, coconut, mandarin really compliment the lovely sweet flavours. Also, they are famous for their mini cup desserts! These mini cup desserts are explosions of flavours, a must Purchese indeed! Catch a train to South Yarra station, and a 8 minute walk to the shop! Open 7 days, 10am - 6.30pm. ocated just few streets away from Uni, you know this is the spot where cool kids hang. Pidapipo uses quality ingredients from both Italian and local producers, they source their pistachios from Sicily, hazelnuts from Piedmont, milk from Warnambool, cheese from La Formaggeria and honey from Honey Fingers. Did we forget to mention that they also have a NUTELLA FOUNTAIN? Yep. The texture of the gelato as it hits your tongue is ridiculously smooth and feels amazing as it coats your mouth in layers of flavor. The shop is super easy to spot, with its bright neon shop sign and the long queue. But, good things are worth the wait, right? They also serve frappe brioches, which is a brioche roll with gelato inside and sprinkled with toppings such as chocolate sauce, sabayon, amarena (Italian sour cherry) and the traditional espresso. They then fill up the inside of your cone with dark, milk or white chocolate; and affogato, as how the Italians do. Just walk straight up towards Lygon Street from Melbourne Uni tram stop and turn left! Peanut butter and blueberry jam. Vanilla creme and chocolate ganache. Lime curd with toasted meringue. These are just a few of the diabetes-inducing flavour combos that have earned Doughboys a reputation as one of the best doughnut joints in town. Made with organic flour, fried in rice bran oil and dipped in natural flavours, it quickly became a doughnut hit among Melbournians. ‘Nut creations have included the “Double D”, coated in dark cocoa icing, crunchy peanut butter icing, roasted nuts and chunky pieces of chocolate; the “Gimmie S’more” with dark chocolate ganache, crumbled handmade graham crakers and torched marshmallow; and the “Key Lime Pie” - lime curd-filled doughnut with toasted meringue and lime-spiked pie crumbs. Most Doughboys doughnuts are the fluffy yeasted variety – either glazed, dusted, iced or filled. They have about 30 recipes with 10 for sale at any one time, with new varieties are being released all the time. I mean, it is okay to have cheat days once in a while... right? Do-nut stress out with all the assignments from uni, take a break and have a doughboy! Located between King Street and William Street, take a stroll along Bourke Street and you’ll find it! Despite being only 15 years old, Morgan (Bistro Morgan) has been supplying cafes around Melbourne with cakes, slices, biscuits and doughnuts. 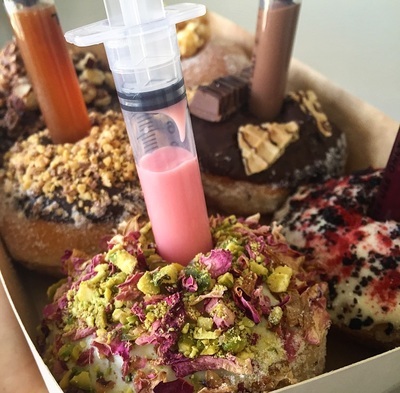 His creations include the Peppermint Crisp and White Chocolate and Raspberry Syringe and Coco Pops, Marshmallow, Banana Peanut Butter and Nutella flavoured doughnuts. He draws inspiration from simply walking through supermarket aisles. They seriously taste as good as they look, and if you’re looking for an Instagram-worthy doughnut, Bistro Morgan’s doughnuts are the way to go. All his doughnuts also undergo a 24 hour fermentation process, where they sit in the fridge for at least 24 hours and when you bite in to them, the concentrated flavour just ERUPTS in your mouth. These lovingly made doughnuts are available at several cafes and here’s 2 of ‘em! So what are you waiting for? Let’s go doughnut hunting! These gems are worth queuing for from 4.30am every Friday, Saturday & Sunday before they are completely sold out! And they do sell out super quick indeed. Kate Reid (owner of Lune) is a trained aeronautical engineer who decided on a career change, and went to study pastry making in Paris. Drawing on her aeronatucial precision it is without a doubt that each of hercroissants are super well crafted. So what else is good other than her croissants? Twice-baked almond pastries and cruffins (a croissant-muffin hybrid) of course! Oh my, my mouth is already drooling. Not stopping at just serving sweet pastries, they have a wide selection of savory ones too. Boundary-pushing savoury pastries might mean danishes filled with duck confit, or carbonara escargots with guanciale (cured pork jowl), parmesan, pecorino and black pepper. Well, personal recommendations? We really recommend the Ham & Gruyere, twice baked almond croissant, kaya cruffin and their weekly specials! Located inside South Melbourne market where all the good food are, never forget to grab yourself one of these flaky croissants or pastry before you leave! Agathé Pâtisserie serves a large, and continuously changing range of authentic French pastries, cakes and savouries – with a focus on innovation. Infused croissants (Pandan, Matcha, Café au lait), along with the “cruffin” (Salted caramel, Nutella, Peanut caramel), will be among the more unusual offerings. Agathé Pâtisserie will be housed in two stalls at South Melbourne Market, which is open every Wednesday, Friday, Saturday and Sunday. Viennoiseries, such as croissants and crème brulee and Danishes will cost $5-$7. Patisseries, including millefeuille and peanut-salted caramel Paris-Brest chou, will be $6-$9. 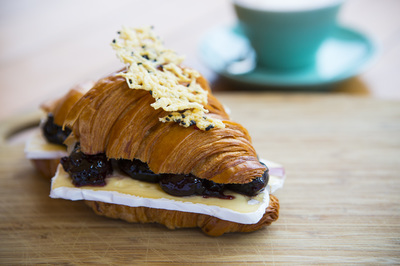 Savouries, such as brie and sour cherry croissants, will be available for between $6-$9. Just look at the flakiness inside the croissant, TO DIE FOR! lright now time for some ASIAN desserts, and a little taste of home. In Dessert Story, you can find all your childhood and hometown faves. Ranging from taro, herbal jelly, tofu puddings and snow ice, the choices are endless! Some of the hot desserts like red bean soup and toufufa, are especially comforting in a cold winter’s night. Also, being the only dessert shop that opens until late at night, it’s definitely the place where you can “yamcha” since there’s no “mamak” shops available here in Melbourne. Located in between Russell Street and Elizabeth Street, take a stroll along Chinatown and you will see it! Naughty Boy Cafe serves up 3 different flavours of these super instagram worthy shakes to feed your belly. Flavours range from chocolate and nutella fudge, salted caramel, pavlova, banana and co. The milkshakes at Melbourne’s Naughty Boy cafe are photographed so often the owners keep a selfie-stick behind the counter. They offer it to customers struggling to take photos of themselves drinking milkshakes piled high with cake, caramel and fairy floss – the cafe’s version of a freakshake. Despite the amazing milkshakes, this cafe also serves up amazing middle-eastern inspired brunch food, a perfect brunch spot for your weekends! eing a home baker, it all started when she started baking for friend’s birthdays or school events, now it’s a small baking business, where she takes orders and makes people happy with her sweet creations. Being only 20 years old, her creations range from birthday cakes, cupcakes, baked doughnuts, cookies and many more! If you do not fancy unhealthy desserts, you can request for raw desserts such as the raw caramel slice which is vegan, gluten free, refined sugar free and dairy free. All these dietary requirements can be applied on normal baked goods too! Every single order is customised to your personal preference and it can be made anyway you like! But, all customised cake orders are to be placed 4-6 weeks in advance to avoid disappointment. PSST, here is a MoMU member only perk, mention “MoMU x Decarawsweets” and your membership number when ordering to get a 10% discount off the price! Email cassxo26@gmail.com to place your order now!